Thank you for your interest in screening BIRTH CONTROL: How Did We Get Here? in your church or community. Watching a film outside of home viewing requires a public exhibition license. 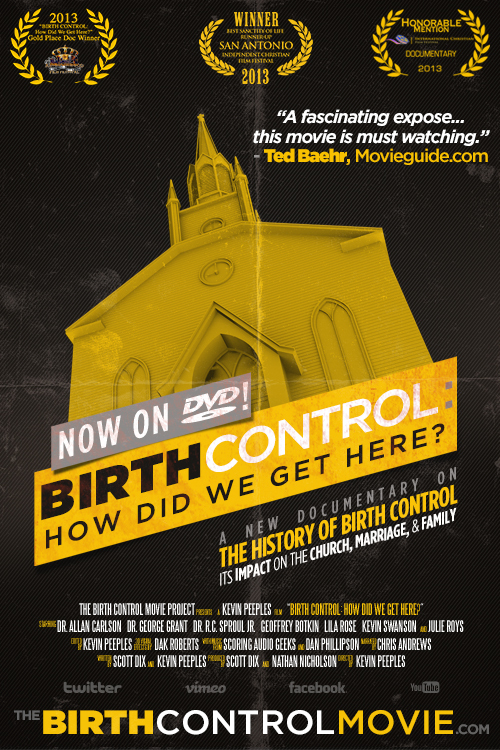 In addition to receiving a one-year licensing agreement for you to show the film, we are pleased to offer BIRTH CONTROL: How Did We Get Here? on DVD for a discounted rate for those who purchase (10) or more units with their license. *The discount Fee applies for those churches who purchase a minimum of (1) DVD 30-pack. BIRTH CONTROL: How Did We Get Here?retails for $14.99. We are offering communities who screen the film a special limited-time discount for DVD purchases in 30-unit increments. Purchases of 10 or 20 units are available at the 10-pack price. Purchases of 30+ units in increments of 30 (can be “60, 90”, for example) are available at $8.33 per unit. Purchase film DVDs in bulk to resell, give to visitors, or stock your church library. Please email us at info@TheBirthControlMovie.com to receive your agreement form. Payment instructions will be in your screening packet, in which you can pay online with a credit card or you may pay by check. Thank you for your commitment to host a screening of BIRTH CONTROL: How Did We Get Here? in your local church or community.